There’s been a trend lately of major movie franchises creating chart-topping soundtracks by recruiting big-name musicians and cool indie artists to contribute to the film. However, the soundtracks to the Lord of the Rings and Hobbit films have been less about selling albums and more about matching the tone of the film. It seems like Peter Jackson may be trying to bridge the gap with “I See Fire,” the first song to be released from The Hobbit: The Desolation of Smaug soundtrack. It was written, recorded and produced by Ed Sheeran and will play over the end credits to the film. The singer, who famously records and tours without a backing band, also played every instrument featured on the song except the cello. He learned the violin parts in one day after inspiration struck and they other producers managed to source a violin for him to play. In fact, the whole song was written and recorded in about a day, immediately after Sheeran had seen the movie in order to best capture his emotional reaction to the story. They even managed to record the music video for “I See Fire,” which Sheeran and Jackson released on Tuesday night. 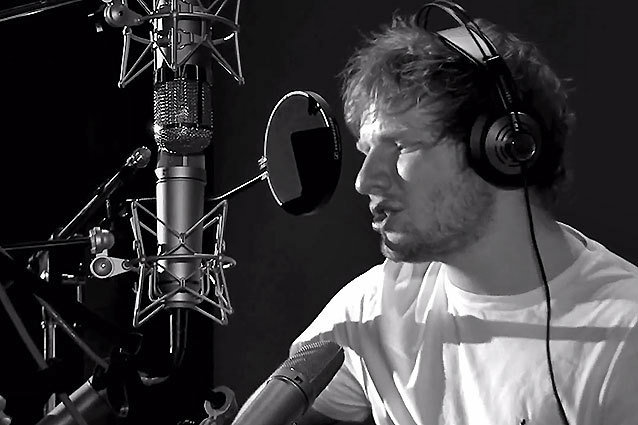 The video features black-and-white footage of Sheeran recording the song and Jackson and the producers working on the mix interspersed with scenes from the first Hobbit film to punctuate Sheeran’s lyrics. While Sheeran’s track features a lot of the same elements as Finn’s — the folk song inspired melody, the haunting, layered vocals — it builds to a crescendo that is a lot poppier than the soundtracks to Jackson’s films usually are, which may result in “I See Fire” reaching a wider audience than usual. The Hobbit doesn’t need any help drawing people into theaters, but with The Hunger Games: Catching Fire releasing its star-filled soundtrack being released later this month, Sheeran’s presence might allow The Hobbit to draw some attention to its own score. Watch the music video for “I See Fire” above, or you can purchase the song on iTunes. The rest of the soundtrack to The Hobbit: The Desolation of Smaug will be available on Dec. 10, ahead of the film’s release on Dec. 13.